DC Collectibles announces new statues and action figures ahead of San Diego Comic-Con 2018 – AiPT! DC Collectibles is going all out, with lots of new action figures and statues to buy at SDCC. Half the fun of comic cons is buying all the cool stuff! DC Collectibles has your back in that department this year, as they just announced a whole slew of action figures, spanning multiple lines including the Bombshells series, statues based on the upcoming Aquaman movie, and a lot more. Check out the full press release below, along with images of the figures. Burbank, CA (July 18, 2018) – DC Collectibles, the award-winning line of collectibles from DC Entertainment, will make a huge splash at Comic-Con International: San Diego with exciting new statue and action figure reveals, headlined by a stunning statue series based on Warner Bros. Pictures’ highly anticipated Aquaman film, hitting theaters December 21, 2018. DC Collectibles will also expand its bestselling Batman: The Animated Series action figure line and add new artists to the company’s cutting-edge DC Artists Alley designer vinyl collection. New character additions are also planned for several of DC Collectibles’ most popular action figure and statue lines, including DC Bombshells, Batman: Black & White, DC Essentials and more. Making waves just in time for the King of Atlantis’ big-screen debut, DC Collectibles will release three new statues based on the character appearances in the upcoming Aquaman film. Jason Momoa’s Aquaman, Amber Heard’s Mera and Yahya Abdul-Mateen II’s Black Manta will be re-imagined with impeccable attention to detail as individual 12” sculptures. The statues will come aboard store shelves beginning November 2018. DC Collectibles will also add new characters to its fan-favorite Batman: The Animated Series (BTAS) action figure line and debut the company’s first-ever Batcycle, as seen in the award-winning TV series. Scaled for 6“ action figures, the Batcycle measures 9.25“ long and includes a variety of light-up features and two free-spinning wheels that enable the bike to turn. The double-sided display base allows fans to “park” the Batcycle in the Batcave or on the streets of Gotham City. The Batcyle set will also include one BTAS Batman action figure that features two interchangeable helmet heads, new articulation points that allow the character to “ride” the Batcycle and a poseable cape. DC Collectibles will also release new individual BTAS action figures in 2019, including Two-Face, Gray Ghost, H.A.R.D.A.C. and Scarecrow. Each character will feature unique accessories based on their appearance in the animated series. In addition to new Batman: The Animated Series action figures, DC Collectibles will also debut 6“ action figures based on the Justice League animated series that aired from 2001 to 2004. 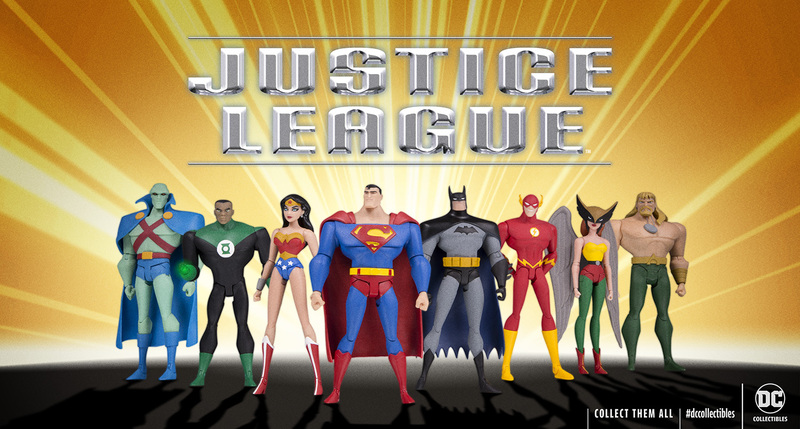 The Justice League animated figures will be available exclusively for members of the DC Universe digital subscription service beginning in fall 2018. Also in 2019, DC Collectibles will welcome two new popular artists–Joe Ledbetter and Chrissie Zullo– to the DC Artists Alley line. Both artists will bring their unique art style to the DC Universe, re-imagining some of DC’s most iconic characters as 7“ designer vinyl figures. Ledbetter, known for his distinct bold lines and vibrant palette, will put his signature spin on Batman, Penguin, Catwoman and Robin. Zullo will debut her dreamy and whimsical transformations of Batgirl, Hawkgirl, Supergirl and Wonder Woman. Ledbetter and Zullo’s DC Artists Alley figures will follow the 2018 designer vinyls illustrated by Chris Uminga, HaiNaNu “Nooligan” Saulque and Sho Murase. Fans attending San Diego Comic-Con can pick up the convention exclusive of Uminga’s DC Artists Alley Batman figure in three different variant editions at the Entertainment Earth Booth #2343 or pre-order the figures online here. On tap for 2019, DC Collectibles will release a new Bat-Family Multi-Part Statue featuring Batman, Batgirl, Robin, Nightwing and Red Hood. The statue set is designed by the award-winning DC Collectibles design team and includes the same versatile bases as the New Teen Titans Multi-Part Statue set that debuts in August 2018. Fans can display one or a few of their favorite Bat-Family characters independently, or for those wanting to own the whole set, the bases fit perfectly together to create one cohesive image. Batman is the first character to hit shelves in March 2019 and the remaining characters will be released throughout the year. Additional 2019 releases include a Batman: Black & White Batman statue based on the acclaimed BATMAN: WHITE KNIGHT artwork by Sean Murphy, new DC Essentials action figures and new character additions to the DC Bombshells and DC Cover Girls statue lines.